One of the books that I have in my study is a book called Every Promise In The Bible . I’m sure that many of you probably have those little Bible Promise books, or maybe little desk-calendars with a promise from God on each page. I used to have several of those, but then I found this book, and I figured that it must be the king of all promise books because it was so big. So I bought it, and got rid of all of my other little promise books, because “Why keep them when I’ve got the bigger and better and more comprehensive book?” Right? Well, as it turns out, the title of this book is a lie. Although it has many of the covenants and promises found in the Bible, it by no means has every covenant and promise in the Bible. While looking through the book this week, I thought of several promises that are in the Bible, but are not found in this book. So do you know what I realized? As good as a book like this is, if you want a book that contains every covenant and promise in the Bible, all you really need…is the Bible. In fact, I think that if somebody were going to sit down and record every promise and covenant in the Bible, they would almost end up copying the entire Bible. There are promises on every page, and in almost every paragraph of the entire Bible. Now, you know what we were told about making promises when we were kids – “Don’t make promises you can’t keep.” Right? And so many of us have learned to not make very many promises. We do not control the future, we do not control the weather, or the economy, or our health. And so many of us have learned to make few promises. And so it is amazing for us, when we come to the Bible, to find promises everywhere! Promises on every page. Promises about nearly every aspect of life. Promises even, about what happens after life. God is not hesitant about making promises. He loves to makes promises. There are thousands and thousands of promises He has made recorded in the Word of God. Promises to Israel. Promises to kings and prophets. Promises to the church. And yes, even promises to you and to me. One man, named Dr. Evereck Storms, counted all the promises and found 8,810 promises. Almost 8000 of those were from God to man. Books like Isaiah, Jeremiah and Ezekiel have over 1000 promises each. Almost every verse in Psalm 37 contains a promise. There are a lot of promises in the Bible. But do you know what is more amazing than the number of promises which God has made? Even more amazing the sheer volume of God’s promises is that He always keeps His promises. God is the greatest promise keeper that ever was. He too lives by that rule about not making a promise He can’t keep. God never promises something He can’t follow through on. He always does what He says. He always fulfills what He promises. As we begin a study of the Book of Luke, we are going to see a couple of these promises that He made, and we are going to see as well that these promises were kept. But before we look at Luke 1, let me give you a brief overview and a few facts about the Gospel of Luke. The book of Luke was written by… surprise, surprise… a man named Luke! Furthermore, because of Luke’s precision, and desire for accuracy, he wrote a top-notch history of the life of Christ. Historians who are not Christians have studied the way Luke writes, and they agree that he is a skilled and accurate writer. If Luke says it, we can trust it. This doesn’t at all mean that the other Gospels are inaccurate. They had different purposes for writing and different ways of organizing their material. Matthew wrote topically, and goes back and forth between recording Christ’s words and Christ’s actions. Mark wrote concisely. His is the action Gospel. He is always using the word “Immediately.” If the Gospels were made into movies, Mark would be found in the Action section of the video store. John is the only evangelistic Gospel, written to show how to receive eternal life. Each of these three Gospel accounts accomplish their specific purposes beautifully. But Luke wrote to provide a reliable, chronological account of the life of Christ. Look what Luke writes in the first four verses of Luke 1. Luke 1:1-4. Inasmuch as many have taken in hand to set in order a narrative of those things which have been fulfilled among us, just as those who from the beginning were eyewitnesses and ministers of the word delivered them to us, it seemed good to me also, having had perfect understanding of all things from the very first, to write to you an orderly account, most excellent Theophilus, that you may know the certainty of those things in which you were instructed. We read here in verse 3, that Luke was writing to a man named Theophilus. We don’t know who he was exactly, but the title Luke gives him, most excellent Theophilus, hints that he may have been some sort of high ranking public official. In fact, of the titles given to Roman officials, the only title higher than the one Luke uses here is that of Caesar. So Theophilus was a high ranking official in the Roman Empire. He could not have gone any higher without becoming the Emperor. Curiously, in Acts, which was also written by Luke to Theophilus, Luke does not use the title there. He does not say, “most excellent Theophilus” but simply “Theophilus.” Why? Ultimately, we don’t know. But there are two good possibilities. First, maybe Theophilus lost his position of prominence. Could it be that he became a Christian as a result of Luke, and lost his authority as a result? That is a possibility. Living for Christ often comes at great cost. The other possibility is that Luke and Theophilus became good friends, so that Luke was able to write to Theophilus in a friendly and familiar way when he wrote Acts. I prefer this second option, but ultimately, we won’t know until heaven. Theophilus, by the way, means “Lover of God” and so although Theophilus was a real person in history, if you love God, then Luke was written to you as well. And in verse 3, we also discover that Luke’s purpose in writing was to give an orderly account of the life of Christ. As I already said, all four Gospels were written with different purposes in mind; Luke wants to write a chronological account. He wants to write about the life of Christ in the order that things happened. You can see that Luke works his way through the life of Christ in a very orderly, systematic, chronological way. We are going to do that ourselves in the weeks and months ahead. 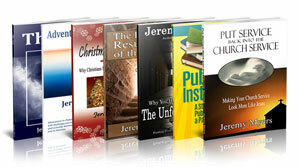 Work through the life of Christ in an orderly, systematic way. Paul said that one of his goals as he went from church to church was to preach Christ, so I want to do that too. Now, we’ve kind of already looked at the Purpose for Luke’s gospel in the first four verses. So let’s turn now to one of the events leading up to the Birth of Christ. In Luke 1:5-25, we come back to what I began talking about this morning. In these verses, we learn that God keeps his promises. First of all, we see that God keeps His promises to Israel. Luke 1:5. There was in the days of Herod, the king of Judea, a certain priest named Zacharias, of the division of Abijah. His wife was of the daughters of Aaron, and her name was Elizabeth. So Luke, right from the very beginning of this passage about how God always keeps his promises seems to imply that one of God’s promises had been broken. But such was not the case! God’s promises never fail! Despite how things appeared, God’s promise in Genesis 49 was still holding true. Luke knew this, and so his statement here is just again a reminder of how God always keeps his promises, even when it doesn’t seem like it. In the rest of verse 5, we are introduced to Zacharias and Elizabeth. We are told somewhat of their genealogical record, which for the Jew, is like a badge of honor. But we learn what is most important about Zacharias and Elizabeth in Luke 1:6. Luke 1:6. And they were both righteous before God, walking in all the commandments and ordinances of the Lord blameless. This is quite a thing to have said about you! These were devout Jews, obedient to the law and the Word of God. It may be because of their obedience that God decides to use them for great things. God can use all sorts of people, but it seems that the people he uses the most are those who are the most faithful to him. Sometimes, our sin holds God back from doing something great in our lives. But Zacharias and Elizabeth were ready to be used by God for they lived blameless before God. It is very important that Luke tells us such thing about them, because look what he says next in Luke 1:7. Luke 1:7. But they had no child, because Elizabeth was barren, and they were both well advanced in years. It is important that Luke told us that Zacharias and Elizabeth were blameless because in Israelite culture, and even in many cultures today, it was considered a curse from God for a woman to be without child – to be barren. If a woman was not able to have a child, it was often thought that it was because God was punishing her for some sin. But we see here that this was not the case. Zacharias and Elizabeth were blameless before God. They were not being punished. You see, often when we are dealing with a crisis, or a sickness in our own life, it is not because God is punishing us. No, there are many other possible reasons for such things. Remember the man born blind in John 9? There too, the disciples thought that this man had sinned, or that his parents had sinned, so that he was punished by God with blindness. But Jesus said that neither this man nor his parents sinned, but he was born blind so that God could be glorified. This was the same reason that Elizabeth was barren – so that God could be glorified. Let’s see how this develops. Luke 1:8-9. So it was, that while he was serving as priest before God in the order of his division, according to the custom of the priesthood, his lot fell to burn incense when he went into the temple of the Lord. The priests cast lots to see who would go burn this incense. I am told that there was something like 32,000 priests who rotated service in the temple. Each group would serve two weeks of every year in the temple. While there, they would cast lots to see which of these priests would go and burn the incense. So normally, a priest would only get to light the incense once in a lifetime. It was a very special thing to do. In this case, the lot fell to Zacharias. And don’t forget Proverbs 16:33 which says, “The lot falls into the lap, but it’s every decision is from the Lord.” The lot falling to Zacharias was no coincidence. So he went in to offer the incense..
Luke 1:10-12. And the whole multitude of the people was praying outside at the hour of incense. 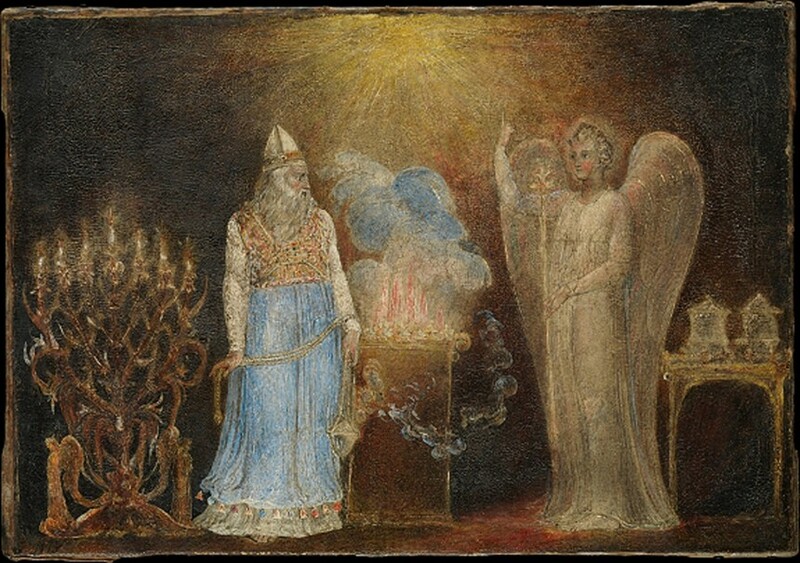 Then an angel of the Lord appeared to him, standing on the right side of the altar of incense. And when Zacharias saw him, he was troubled, and fear fell upon him. This is always the response when someone sees an angel. I hear and I read of people who have claimed to see angels. Television is full of such stories. We always hear about how the angel appeared in glowing white, and how the person felt tingles and shivers and a warm sense of love and well being. But whenever I read of people encountering angels in the Bible, they always tremble with fright, and fall flat on their face in fear for their lives. It’s not really for me to judge whether they have seen an angel or not. All I know is what I read in the Bible. And so we must be very careful. Remember, the Bible also tells us that the devil masquerades as an angel of light (2 Cor. 11:14). But this truly was an angel – we know from verse 19 that it was Gabriel. And in verse 13, we see the message he was sent to share. Gabriel says that he does not have to be afraid of him, and that his prayer had been heard. But, what were they praying for? Well, obviously, they had been praying for a child. However, we’re going to see in verse 18 that Zacharias had long ago stopped praying for a child. He had given up on God. He had thought his prayers for a child were not being heard, or had been ignored. The angel tells him that his prayers had been heard, and that God was now going to answer. Look at the rest of verse 13. Do you want to know why God waited so long to answer the prayer of Zacharias and Elizabeth? Because He had something better in store for them then they ever imagined! They were simply praying for a child, but God didn’t want to give them just any child. He wanted to give them John the Baptist. And do you remember what Jesus said about John the Baptist? Over in Luke 7:28, Jesus said that John was the great person to be born of a woman up to that time. Isn’t that amazing? Zacharias and Elizabeth were praying for a child. They prayed and waited and prayed and waited. And no child came. But it wasn’t because God didn’t hear their prayers. It wasn’t because they were sinning and so God wasn’t answering their prayers. It was because God had something in store for them beyond anything they could ask or imagine. They would become the parents of John the Baptist who would prepare the way for Jesus Christ. They had waited and waited and waited, and God had finally answered, in His own time, and in His own amazing way! But they had not been the only ones who were waiting. Do you see what Gabriel says in Luke 1:17? He quotes from the Old Testament. If you have footnotes in your Bible, you will see that he quotes from Malachi 4:6. This verse is the very last verse in the English Old Testament. It’s on the last page of the Old Testament, in the last book, the last chapter, the last verse. We read, “And he will turn the hearts of the father to the children, and the hearts of the children to the fathers, lest I come and strike the earth with a curse.” This is a promise to the nation of Israel that God is going to send a man like Elijah – see Elijah mentioned there in Luke 1:5? – to reunite Israel. So here is a promise of God – that’s what we’re talking about in this passage today, right – the promises of God – here’s a promise of God to the nation of Israel. Do you know when this promise was made? It was made around 450 B.C. That is, this promise of God was given about 450 years before it happened. Zacharias and Elizabeth had been praying and waiting for maybe 20 or 30 years for a son, but the people of Israel had been praying and waiting for this promise to be fulfilled for 450 years! That’s a long time to wait for a promise. And yet God is faithful and he always keeps his Word. His promises never fail. God kept his promise to Israel. But let us return to Zacharias because it is with him that we learn another lesson about the promises of God. God kept his promises to the nation of Israel, and God keeps his promises to individuals like Zacharias. You know what Zacharias does here? He questions God. He doubts God. He says, “Well, I hear what you’re saying, but I don’t think it can happen. And then he tries to give God a lesson in biology and procreation.” But do you want to know what else we see here? We see that Zacharias had stopped praying for a child long ago. We don’t know how long, but it may have been ten or fifteen years since he had prayed for a child. You say, “Where do you get that, Jeremy?” I get it from the fact that Zacharias doubted. Look at it this way. If he had still been praying, he would have said, “Wow! An answer to my prayer!” That’s what you do when you get an answer to prayer. That’s what I do. But that is not what Zacharias did. Why not? I believe it was because he was no longer praying. Zacharias had long ago given up on God. He had long ago stopped believing that God would answer that prayer. Is that where you are at today? You’ve prayed and prayed and prayed – but it seemed like God never heard, or that God was ignoring you, or that God was telling you “no.” Maybe you’ve stopped praying. Maybe you’ve stopped believing. Maybe you’ve stopped hoping. Let me say with Gabriel, “God has heard your prayer.” He will answer, in His time. And even if you have stopped praying, even if you have stopped believing, we read in 2 Timothy 2:13 that even when we are faithless, he remains faithful. God has something better in mind for you than you can ask or imagine, and He is simply waiting for His timing to make it happen. It may be tomorrow, it may be next week, it may be 10 years from now. You may even have to wait until you get to heaven. But do one thing for me. When your answer comes, when God says, “Ok, now I will work to give you that thing you’ve been praying for,” don’t doubt God. Don’t question God. Don’t talk back to God. That’s what Zacharias did here in verse 18. Look at the result in verses 19-20. Doubting God is always a “dumb” thing to do. Some of you got that. We see in these verses that because Zacharias doubted, God makes him dumb. He became unable to speak. Luke 1:21-22. And the people waited for Zacharias, and marveled that he lingered so long in the temple. But when he came out, he could not speak to them; and they perceived that he had seen a vision in the temple, for he beckoned to them and remained speechless. This is where the game charades was invented…imagine getting this one. How do you act out an angel appearing and telling that you are going to have a son? Luke 1:23. So it was, as soon as the days of his service were completed, that he departed to his own house. God accomplished his purposes. God fulfilled his promises. Just because 450 years had passed for Israel, God had not forgotten. Just because Zacharias had stopped praying, and just because he doubted God, this did not stop God either. God’s promises will be fulfilled in His own timing and in His own way. And more than that, our disbelief does not keep God from accomplishing his purposes. He does what he wants whether we believe him or not. We may be disciplined a bit for our unbelief like Zacharias was here, but God does what He wants whether we believe Him or not. And look, in Luke 1:24-25, God did what he promised. God always keeps his promises. He kept his promises to Israel. He kept his promises to Zacharias. And He will keep His promises to you. In causing Elizabeth to become pregnant in her old age, we read at the end of Luke 1:25 that God took away her reproach. God removed her shame of barrenness. One of the greatest promises in the Bible which God has given to each of us is that like Elizabeth, He will take away our reproach and our greatest shame. This is what we read in Colossians 1:21-22: “And you, who once were alienated and enemies in your mind by wicked works, yet now He has reconciled in the body of His flesh through death, to present you holy, and blameless, and above reproach in His sight.” Our greatest reproach, our greatest shame is our sin. And God has promised that due to the death and resurrection of His Son, Jesus Christ, we can have that shame, and that reproach removed. God always keeps his promises, and this is one of His greatest. His greatest promise is that anyone who believes in Jesus for everlasting life, receives it (John 3:16; 5:24; 6:47). God offers you and I the free gift of everlasting life which cannot be lost, and this gift is only received by simply believing in Jesus for it. This is God’s greatest promise to you, which He will keep, because God is the greatest promise keeper. Shiloh literally means “the one to whom it belongs” and as used here, is another term for the promised Messiah, the promised Seed. This verse tells us that the royal line would rise from the tribe of Judah, and that it will always have the royal authority until the Messiah comes. And this is exactly what happens. But over time, because of sin and disobedience, the Israelites lose more and more of the power to rule themselves. Until finally, all that was left of the ruling power in Israel is the authority of the Sanhedrin. The scepter had not yet departed from Judah, but the only thread they had left was the power and authority of the Sandhedrin. But in that year, the Roman Procurator Caponius took away their last shred of ruling power. And the Jews alive at that time thought that God’s Word had failed. Never had there been a prophecy which did not come true, but finally, they thought, one of God’s promises failed. One of these teachers wrote, “Woe unto us, for the scepter has departed from Judah, and the Messiah has not come.” (Babylonian Talmud, 4,37). When was this written? It was written right about the time when a young boy of about 12 years old is marveling some of these teachers at the Temple in Jerusalem. Right at the time when they were bemoaning the fact that God’s Word had failed them, and they had been rejected by God, there was God’s Word in the flesh standing right before them, showing them that rather than rejecting them, God himself had come to deliver them. God’s Word had not failed. It had been perfectly fulfilled. Good stuff, Jeremy, this is an often over-looked aspect of Luke’s gospel – the promise/fulfillment theme. Note also, the same pattern follows right into the angel appearing to Mary and the angel(s) appearing to the shepherds. Promises given, promises fulfilled – and in these three cases some promises given that can be immediately verified so the recipients will know the exact truth of what the angel had told them. Enjoyed your article! Thank you. Excellent points. Yes, so many promises… and all fulfilled! This is a great encouragement when we remember the numerous promises from God in Scripture to us. Glad you enjoyed it! I hope the other sermons on Luke are also beneficial. Thanx for making understand that verse. Bless you. Can I use parts of your explanations on our advent reflections /sharing for our catholic community service which will be translated to Filipino. Yes, of course! Thanks for asking.